Minimalism can be overblown. Watch Tiny House Hunters on HGTV a few times and you'll quickly see home shoppers who think they want to live in a tiny home none too pleased when they see how small 200 square feet really is. Travel like a minimalist, however, and you'll never look back. You'll save money, you won't take as many souvenirs home, you will be nimble at your destination, and you will feel more like a local, among other benefits. Those factors only grow when done together as a family. Converts to a backpack or has a detachable daypack. Fits carry-on size rules for your airline. Your carry-on should fit in the overhead compartment on a plane. You won't have to pay baggage fees, and you will be able to go straight to your hotel upon arrival instead of waiting at the baggage claim carousel. It will also make it easier to get on and off public transportation, saving you more money, and it will make traveling less of a hassle overall. 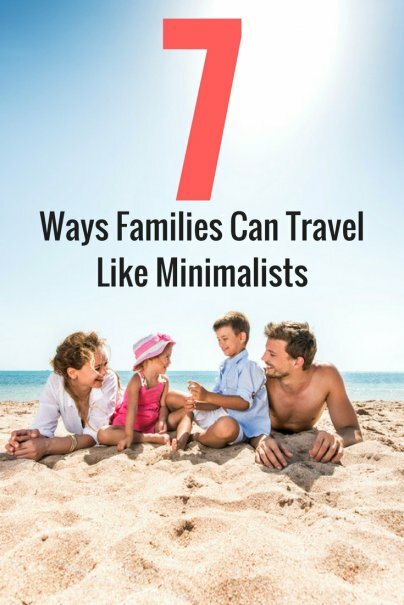 This should go without saying if you want to travel as a minimalist. But it's worth thinking about and coming up with a plan. Pack only clothes you'll definitely need, not something for every occasion. Dark clothes that can be washed by hand and can be combined with other pieces to make many outfits are best. Bring no more than one pair of shoes in your bag. Remember, you're wearing a pair of shoes on your feet, too, so anything more than that is extra. Pack enough clothes for your trip, and then subtract two days of clothes. If you'll be gone for seven days, pack for five. Some things you can wear twice and you can wash them by hand if needed. If you're worried about your clothes wrinkling, chances are your hotel will have an iron. I usually buy a shirt or sweatshirt during a trip as a souvenir, giving me at least two fewer things to bring from home. I've seen suitcases stuffed with more add-ons than clothes, and toiletry bags almost as big as small carry-on bags. Don't be the traveler who packs items you think you'll need "just in case." If it rains on vacation, you can buy a cheap umbrella. If you run out of toiletries, either your hotel will have some, or you can buy some at your destination. It's easy to pack everything you could possibly need and forget that there are stores at your destination that sell socks and other things if you run out. Hotels have hair dryers, for example, and yet many people haul one with them on a trip. When packing toiletries, find travel-size containers at a drugstore or buy the smallest toothpaste, shampoo, and other items you can find. Don't pack sunscreen, bug spray, or any other optional items that you can buy when you arrive. For a trip of a week or more, I always plan on doing laundry. Either visit a local laundromat or rent a home or apartment with a washer and dryer. If necessary, wash some clothes in a bathroom sink or tub with regular soap. A phone is almost a necessity when traveling, so bring it and check your phone plan before leaving to make sure you'll have service. And don't forget the charger — or an adapter, if you'll need it. Every other gadget should stay at home. Laptops, tablets, electronic games — and the cords needed to power them — will all be fine at home. These things can be heavy, cumbersome, and can make your passage through security more difficult. But more importantly, they can take away from your time together as a family and allow you to forget why you're on vacation in the first place — to relax. I usually bring one or two physical books with me on a trip. When I'm done, I leave them at my destination for the next visitor to enjoy. Kids can also bring physical books in a small backpack, along with paper, crayons, and other things to keep them occupied. And make do with the in-flight entertainment options. Traveling as a minimalist is about more than taking fewer things with you when you travel. It should also include using fewer resources and polluting less. Trains, buses, trolleys, and even bikes are cheap or free in most cities. They can take more time than renting a car or using a taxi, but they can add to your experience and make you feel more like a local. Weekly passes are sold at many transit agencies, and you can buy train tickets online before leaving home. The home will likely have a washer and dryer, cutting the clothes everyone will need by at least half. Pick a home that has kids the same age as yours, and ask if your children can use their toys, crib, high chair, and other baby gear. Just like your home, the home you rent is probably near a few stores. So if you need something that you forgot to pack, or didn't want to pack, then you can buy it quickly. Shopping locally can be one of the best ways to see how another culture lives. Wherever you travel, going as a minimalist should help you appreciate what you have. You'll find that you can get by with a lot fewer things than you thought you could, and your family may just enjoy the trip a lot more with fewer items to carry around.